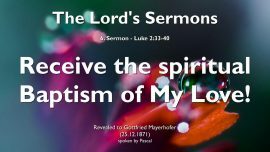 This entry was posted in 53 Predigten von Jesus - 53 Sermons of Jesus and tagged 6. 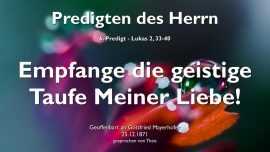 Predigt von Jesus, 6th Sermon of Jesus, Das Kind Jesus im Tempel, Der Schreibknecht Gottes, Empfange die GEISTIGE TAUFE Meiner Liebe, Geist Meiner Liebe, Gottfried Mayerhofer, La presentazione di Gesù nel tempio, Predica 6 del Signore Gesù, Receive the SPIRITUAL BAPTISM of My Love, Spirit of My Love, The Child Jesus in the Temple by jcadmin. Bookmark the permalink.